On 2 January this year, South Africa became a non-permanent member of the United Nations (UN) Security Council for the first time. The UN is an association of countries set up in 1945 to promote peace and co-operation between nations. The Security Council of the UN is its most powerful body. The Council's job is to help keep peace and security among the world's nations. It has the power to make decisions which UN member countries must carry out. The decisions of the Council are known as UN Security Council Resolutions. The Security Council has five permanent members. They are China, France, Russia, Britain and the United States of America. Being a non-permanent member of the Council means South Africa is one of ten nations from around the world that have a seat for a period of two years. Foreign Minister Nkosazana Dlamini-Zuma, said South Africa was "greatly privileged and honoured" to be elected to this important Council. She said South Africa would use its new position on the Council to serve the continent of Africa. South Africa's seat on the Council is important because it gives us the opportunity to represent the rest of Africa when decisions are made. 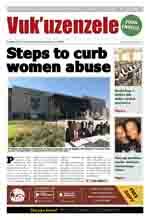 South Africa will also be able to help prevent violence and wars and to find solutions to problems. In doing so, South Africa will have an opportunity to improve co-operation between the UN Security Council and the African Union Peace and Security Council. 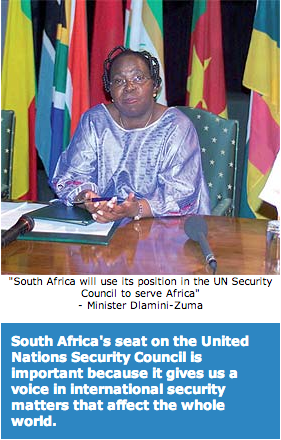 South Africa's seat on the UN Security Council is also important because it gives us a voice in international security matters that affect the whole world.